MIAMI LAKES, FL (www.orangebowl.org) — Cortland’s Kyle Richard is this week’s nominee for the 2018 Capital One Orange Bowl-FWAA Courage Award. Richard, a senior linebacker, was shot twice in the summer of 2017 after interrupting a sexual assault. pursued an assailant outside of a party on Long Island in July of 2017. The assailant pulled out a gun and shot at Richard three times, hitting him once in each leg. 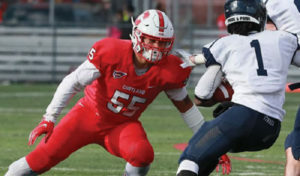 The 6-foot, 230-pound Lakeview, N.Y., native under-went intensive physical therapy and was able to return to the field and appear in 10 games that season, finishing second on the team with 75 tackles, along with 4.5 tackles for loss, three sacks, two fumble recoveries, nine quarterback hurries and two pass breakups. The two-time captain finished the 7-3 Red Dragons’ sea-son this fall tied for the team lead in tackles, with 71, to go with seven tackles for loss, 1.5 sacks, one interception, two pass breakups, three passes defended, four quarterback hurries, one fumble recovery and one safety. In April, Richard was presented with the Biden Courage Award for Bystander Intervention by former Vice President Joe Biden. Additionally, Richard has received a thank you note from NFL commissioner Roger Goodell. Richard has become an outspoken advocate for victims of sexual assault, speaking at a number of awareness events, deflecting personal attention while hoping that others follow his example and step up when presented with an opportunity to act. For opportunities through the Ambassador Program presented by Panera Bread, log on to www.orangebowl.org or follow the @OrangeBowl on Facebook, Twitter, Instagram, YouTube and Snapchat.